Well, yes, of course. That’s exactly why I drink it. I want to make sure that every day I ingest as many beneficial bacteria as I can. After all, I – like you, gentle reader, and all other humans walking around – am composed of more bacteria by far than I am my own human cells. Mark McAfee (owner of Organic Pastures Dairy Company) calls us “bacterio-sapiens,” and I think the name fits well. We have 8 pounds or so of various kinds of bacteria in our guts, and if they’re the right kind, they make our B vitamins for us in return for room and board. They also help keep pathogenic bugs (the ones that really can make us sick) at bay. So I want a vibrant population of these guys at all times! But too often, largely due to the easy-to-tell media story, most of us hear the word “bacteria” and silently affix the word “bad” to it. What a shame. This fear has probably done as much to harm our health as any of a whole host of other silly public health practices I could name (and will, in future posts). It’s led to triclosan-laced hand sanitizers. Nice-smelling, chemical-laden cleaners guaranteed to wipe out 99 percent of the bacteria found around the home. Kids not allowed to play in the dirt or roll around with the dog on the floor. Hamburgers cooked to a uniform grey. And on and on. It seems like the more sterile our homes, yards, and food, the better we like it. Don’t get me wrong: I’m not saying that a clean home is a bad thing. Cleanliness is next to godliness and all that. But clean is one thing, and sterile quite another. If my gut is sterilized (via course after course of antibiotics, for instance), then any old bug can propagate there and send my guts into a tizzy (called bloating, or indigestion, or irritable bowel syndrome, and so on). But if my healthy gut bacteria are properly nourished (i.e., fed probiotic-rich foods like sauerkraut and kefir and kimchi), I believe that I will be much less susceptible to every stray bad-boy germ that wanders by. My plan is to keep those good bacteria in good shape, ready to support me every step of the way. In that glass of raw milk? Yep, plenty of probiotic bacteria. I want to know that the farm the milk came from is clean, of course, just like my house. But I also know that if I want, I can visit the farm. Try that with the mega dairy that produced the pasteurized version. I’d rather have the fresh version, myself, coming from one cow, filtered and cooled and bottled. It’s poorer cousin is pooled from the milk of hundreds of cows, separated into components (whey, casein, cream) and combined again into whole, 2 percent, 1 percent, skim, heated to a high temperature to kill off any bacteria (leaving their little corpses behind), and finally forced through a mesh so what cream there is cannot rise to the top. No wonder it promotes allergies (remember the dead bacteria), while the unprocessed version seems to help resolve or prevent them. Keep the sauerkraut (unpasteurized, of course) coming, along with the (unpasteurized) miso in my soup and the (lightly cooked) grass-fed meats and the (raw) egg yolks in my smoothie. Sure, the wrong kind of bacteria can be a problem – but if we’re fortified with the kind of diet that promotes our sturdy, beneficial gut bacteria, we’ll be a lot more likely to be able to deal with a pathogen or three without breaking stride. 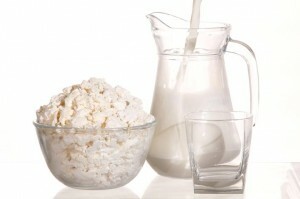 So yes, please, now that you mention it, I would like some bacteria with that glass of raw milk! This entry was posted in Cultured/fermented foods, Food safety and tagged food safety, health, kefir, kimchi, probiotics, raw milk, sauerkraut by Blochster. Bookmark the permalink.